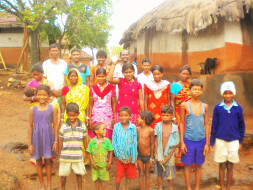 This Christmas season, we are fundraising to bring light to communities in Purulia, West Bengal. In remote, tribal Dhanchatani, atop the Ayodhya Hills in Purulia, West Bengal, ten families living in close proximity have taken their first step to access clean, cheap lighting through the installation of a solar micro-grid. They have formed a group and approached the Milaap lending community for a loan of Rs. 52,500 to fund this installation, which will help them save the Rs. 150 they spend each month on kerosene. Surviving off forest and local produce, with little access to currency, Rs. 150 is a huge saving that they can hope to invest in their livelihoods and children’s education. Many families in rural India struggle with no access to electricity and lighting. 9 other smaller hamlets in and around the Ayodhya hills – Lokaichatani, Usuldungri, Teliabhasa, Borogora, Bhuigora, Lebuchara, Baralaha, Hedelbera, and Ranga – hope to resolve this struggle of theirs by approaching the Milaap community for loans to install their own solar micro-grids. These grids, installed by Mlinda, will provide them an economical clean-energy alternative, powering 2 light bulbs and a cell-phone charger in each home for 5 hours. By contributing to a loan of Rs. 525,000, you can bring light to all these 10 hamlets and their 100+ families, who are cut off from the power grid.